Best website to find short term rental holiday accommodation at Port Augusta. Best Internet Rate Guarantee - Looking for the best available rate? No need to look further, Executive Holiday Rental guarantees you the best rate. You can instantly book and pay online via our secure booking service . Simply enter the date and number of guests select your desired property, view the availability and book your stay............... All you have to do is pack. 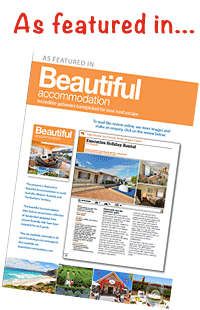 "We're delighted to be included in the latest edition of Beautiful Accommodation - Australia's discerning guide to handpicked accommodation." When you go away accommodation can really make-or-break you! If you are heading to Port Augusta for that well-earned break renting a self-catering accommodation like a holiday home it allows you not to have the hassles associated with hotel and motel accommodation but you can have the privacy, space and comforts of home. At first glance they may appear to cost more than hotels and motels but when you consider that the cost per person becomes lower when the more the guests that stay. Holiday rental homes are unbeatable value for larger groups. Fully self-contained holiday home offer the best value for money. Not only can it be cheaper than a hotel or motel – it is much more exciting! You get to live in a fully furnished home, with all the amenities and a full size kitchen, where you can make your own meals. When you rent a holiday home you are the only occupier and is booked for your exclusive use. You do not share with other guests. Holiday homes are the most sought after alternative to staying at hotels, motels and caravan parks. Not only do they offer great value, each and every holiday home is different which includes a combination of unique features guaranteed not to be found in any other accommodation. "Why stay in a room when you can have the privacy, space and comforts of home"
Often family members will share a room, two families or a group will share a house. Workers & professionals when working away, seek home like conditions, as matter of fact better than home, they want, security, privacy, space, a comfortable bed, a good shower, decent TV`s, be able to email loved ones an outside area where they can relax and have a BBQ. Why would they or should they stay in a room when they can have the privacy, space and comforts of home. Employers are now realizing they cannot expect the best from the workers if suitable accommodation is not provided to meet their needs. Port Augusta has mild weather and outdoor living is paramount, relaxation areas is essential with a decent BBQ with crockery and cutlery and a fridges to keep the very important drinks cold. Holiday homes are suitable to be used for birthdays, family reunions or any social or corporate get-together. Ideal for the needs of contractors, shift workers, tradesmen or professionals, the working people of Australia, working away from home. 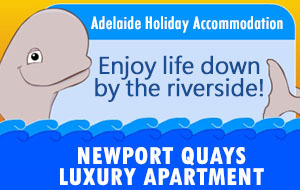 Very popular for families and groups seeking accommodation when attending major events. Fully self-contained holiday homes include everything you would need are well maintained, furnished with modern conveniences, the owners taking pride in providing the finest quality for its guests. Regardless if you are on family holidays, travelling executives, working men, contractors or shift workers sometimes you just want to relax and enjoy the comforts of your holiday home. Our holiday homes have unlimited Foxtel and just not the standard package. This means that you will never run out of entertainment. Whether it is following your favorite footie team or sitting back with a range of movie options, it is all at your fingertips. Room to Relax – “dine in or dine out, the kitchens always open”. When you rent a spacious holiday house like ours it gives you the space to really relax, with a fully equipped kitchen to prepare your meals, more than the savings you get to enjoy – it allows you to spend quality time with your family or friends during meals and makes it more appealing to your wallet. We at Executive Holiday Rental have been able to identify that there is a need as well as an opportunity that exists in Port Augusta to offer top quality accommodation for upmarket accommodation at affordable prices. Our commitment is your home away from home should be better than home. Executive Holiday Rental`s holiday homes are very functional, superbly appointed with quality furnishings, flats screen TV, free pay TV, outdoor entertainment area with barbeque, fully self-contained, including everything you would need – electric blankets, all bed linen, pillows, continental quilts, summer & winter blankets, bathroom & tea towels, all you need to bring with you is clothing, personal effects and a smile. At Executive Holiday Rental you book direct with the owners. 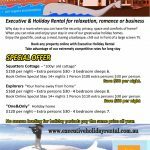 Port Augusta Executive Holiday Rental offer an "affordable and comfortable stay, value for money and freedom of choice".